Tiffany is a very popular brand in middle east .Tiffany brand is owned by iffco company based in dubai . The business is looked by Allana group . 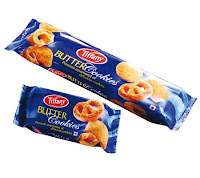 Tiffany covers juices , ready to eat products , food product apart from Bakery items ( biscuit , wafers , cakes and cookies ). As far as the market share in concerned tiffany almost cover 65% of bakery product market . Major products are nice , bourbon , cream , crackers , wafers . Indian Brand such as Britannia is a world brand, after all it is controlled by historical Royal families.